Hi everyone! Just wanted to take a minute to wish everybody a Happy Fourth of July. Stay safe, enjoy some good BBQ and celebrate! 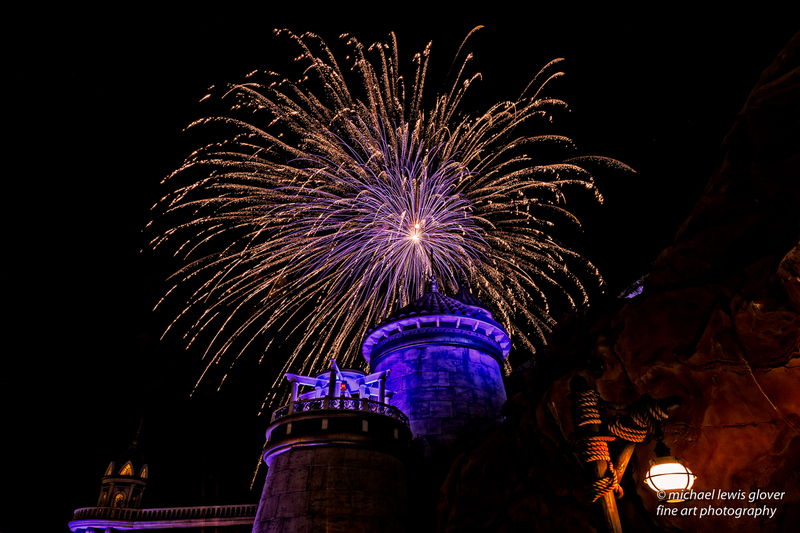 This is a shot I took at Disney’s Magic Kingdom during the ‘Wishes’ fireworks display. The new Fantasyland area includes a Little Mermaid ride – Under the Sea ~ Journey of The Little Mermaid. Prince Eric’s castle stands prominently in the foreground with a beautiful purple glow. 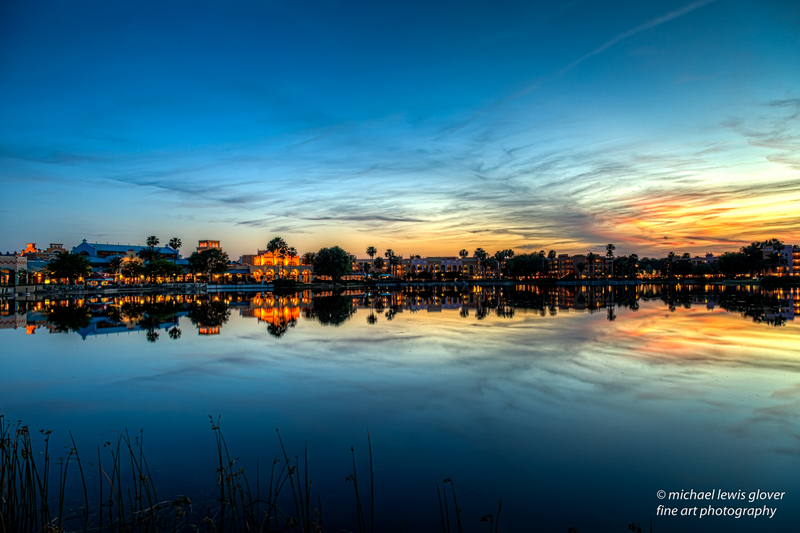 Welcome to Disney’s Coronado Springs Resort, a Spanish-colonial style resort hotel with a beautiful lake view. To get this shot I knew I wanted to be there at sunset. I was here earlier in the afternoon and the water was too ripply to get a nice reflection. I was hoping the breeze would subside by evening and the water would look like glass. I was not disappointed! I ended up circling the entire lake by the time the night was over. I shot from several different areas looking for the right balance of buildings, reflection, sunset color, and a little bit of foreground element to complete the image. I was really happy how this one turned out. Today’s blog post features one of my favorite buildings at Disney’s EPCOT. 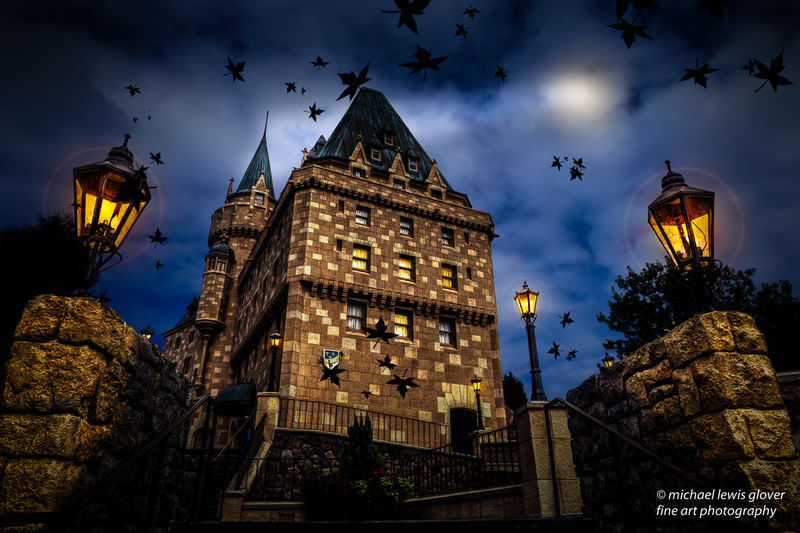 It is located in the Canada section of the world showcase. The building was designed to resemble The Fairmont Château Laurier that is located in Ottawa, Ontario. There is a fantastic steakhouse that resembles a wine cellar underneath the building aptly named Le Cellier Steakhouse. Here is the story about this photo. Ok wait a second, that was all a vision in my head! For a long time I have wanted to get a picture of this beautiful scene at night. However the dilemma has been to get the shot without people. The way the lights illuminate the area always catches my eye. So how can I turn my vision into reality? Shoot it the early morning hours before anybody is there and then use a little Photoshop magic to turn day into night! 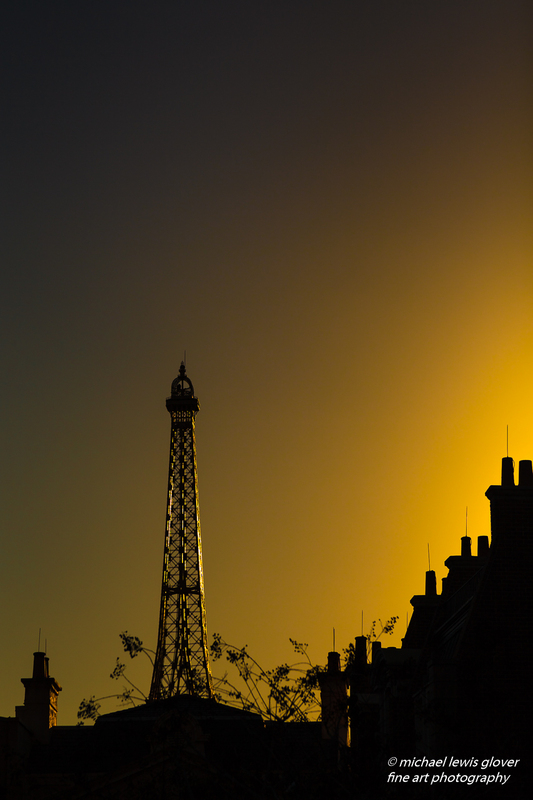 The original picture is an HDR from three bracketed exposures, then processed to my taste. A little time with a brush tool to turn the lights on and create the glow added a lot of character. The clouds were perfect to add in a little bit of diffused moonlight. Add in some light beams to illuminate the top and finish off with some maple leaves and it’s done. So whenever you think you can’t get the shot you want, just think out of the box. You never know where you’re creativity will take you! If you would like to view more pictures on my blog from Disney, just click here. I am really excited to share some news! I now have artwork for sale at Disney! I have four new pieces that were created exclusively for Disney. Due to contractual agreements I can’t show any photos of them here. But if you would like to see these in person or if you are interested in purchasing one, you can find them at The Art of Disney at the Downtown Disney Marketplace. All four pieces were created from my original photographs. The first of the four pieces was inspired by the movie classic “Lady and the Tramp.” It is from Tony’s Town Square Restaurant located right up front in the Magic Kingdom theme park. The finished piece is a die-cut shaped like the original sign that hangs outside. The second piece is from one of the attractions at Disney’s Hollywood Studios. The Great Movie Ride takes guests on a ride through the movies. This piece is also a die-cut and resembles the original sign. The third piece is the sign that is painted on the building of the restaurant “Mama Melrose’s Ristorante Italiano” which is also located in Disney’s Hollywood Studios. It features a resemblance of the Mona Lisa wearing sunglasses. 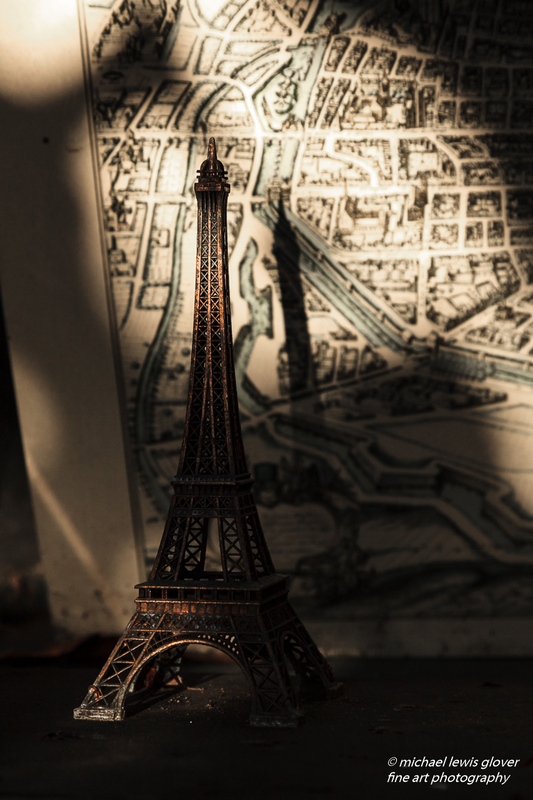 This piece is printed on wood. The fourth piece is of a classic tow truck named “Oscar’s” located in Disney’s Hollywood Studios as well. It is situated in front of a replica of an old-time gas station. It is also printed on wood. Stop by and check these out if you are in the area. 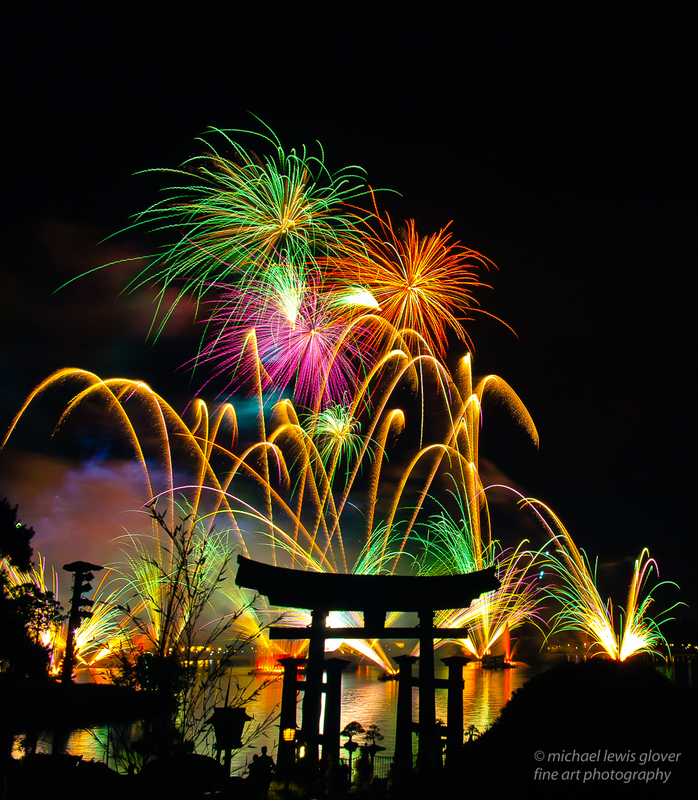 Here is a “blast from the past.” This is a fireworks shot I took in 2010 at EPCOT. Originally titled “Fireworks Over Torii Gate” this was a 25 second exposure in order to capture multiple fireworks in one picture. Just wanted to share a quick post and wish everybody a very Happy New Year. I hope your 2014 is your best year ever. I truly appreciate all of the support and encouragement of my blog over the years. Thanks for all your friendship!